Before any marine coating product leaves our facility, it is tested for quality. Each product is subjected to 12 categories of separate tests. Our professional staff of experts take pride in making sure every Sea Hawk product leaves our facility at its best. Sea Hawk uses only the finest quality raw materials available and prepares every formula to exact specifications in our own facility. In order to ensure the highest quality products, we retain a sample of each batch of paint made. As a result, the quality can be monitored for up to six years after the product is released from our factory. New Nautical Coatings, Inc., takes pride in Sea Hawk products. From boat bottom paint antifoulant coatings, to marine primers and specialty coatings, each product is specifically designed for ease of application and premium performance to fulfill a specific set of conditions. Our quality is second to none. Bottom paint for aggressive control of all types of marine fouling, from barnacles to slime and algae. Paintable acrylic temporary protective film, non-antifouling aluminum trailered boat paint, marine paint stripper, and more. Low VOC de-waxing etch and cleaner and Wax “N” Grease Killer used in preparation of bottom painting. Thinners and reducers designed for use with Sea Hawk products. 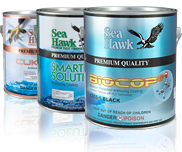 A convenient source for eight types of Premium Grade Sea Hawk solvents. Sea Hawk products for all types of marine projects and repairs. Hawk Epoxy – A state-of-the-art epoxy system for building and repairing fiberglass boats, planes, surfboards, canoes, and many other substrates. Designed for the highest quality wood work, with outstanding results and durability. A combination of high quality pure phenolic modified tung oil provides excellent weathering performance and will enhance the richness and beauty of the wood with classic bright work appearance.